Alright so this is gonna be another short blog... but it is extremely important that I get out the exciting news! I have been writing a lot of blogs about Scott lately and I cannot help it, good things just keep coming his way! 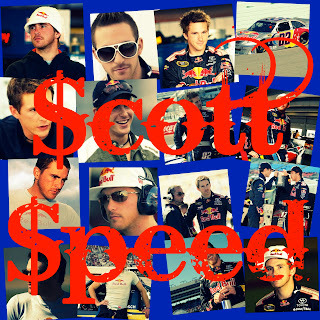 :D Well today I was woken up by news that Scott has a full ride for the rest of the NASCAR Sprint Cup Season! :D How exciting is that? Here is the article from facebook! CHARLOTTE, NC (August 22, 2011) – Scott Speed has signed on with Whitney Motorsports to run the rest of the 2011 NASCAR Sprint Cup Series (NSCS) races in the No. 46 Ford Fusion. Speed has recently been driving the No. 37 Ford Fusion and has qualified for all three NSCS races that he has attempted. Speed also just came off of a sixth place finish for Kevin Harvick Inc. this past weekend in the NASCAR Nationwide Series race in Montreal. The No. 46 Ford Fusion, with the FR9 Roush Yates engines, owned by Dusty Whitney, plans to run the remainder of the races this season in the NSCS starting at Bristol Motor Speedway this weekend. Speed has 79 NASCAR Sprint Cup Series starts, with one top-five and three top-10s, nine top-10s in 14 starts in the NASCAR Nationwide Series, and one win, four top-fives and nine top-10s in 16 starts in the NASCAR Camping World Truck Series. The No. 46 Ford Fusion sits outside the top-35 in the NSCS Owners Points, therefore Scott Speed will have to qualify the car at each race. So this is the article I read this morning and was overjoyed. Scott Speed fans like me have been waiting to hear this exciting news for months. Who knew that a top 10 at montreal would get a full time ride for the rest of the season. Yes Scott will have to qualify each race but i am so so happy for him and only can wish him the best of luck for the duration of the season! Good Luck Scott We all will be cheering you on! Thanks for reading this brief but important blog! I cannot express how much i love the fan support for all the blogs i do! :D thank you to all who read and RT and give my blog so much love!